Polar material featured Whaling letters selling for £2230. A packed room awaited a sale of great variety which began with some most unusual literature including a China 1933 postal atlas which reached £940. Sir Rowland Hill’s personal copy of “Her Majesty’s Mails” by William Lewins, 1864 sold for £500. A remarkable assembly of Polar Mail, both Arctic and Antarctic saw fierce worldwide competition and featured a collection of entire letters to or from American Whalers which sold for £2,230; a 1903 cover from the Discovery Antarctic Expedition to the Secretary of the Royal Geographical Society made £1,060. A cover sent by Sir Ernest Shackleton from the 1907 British Antarctic Expedition at Cape Royds sold for £760; Falklands saw a cover from the 1934 British Graham Land Expedition sell for £1,120. 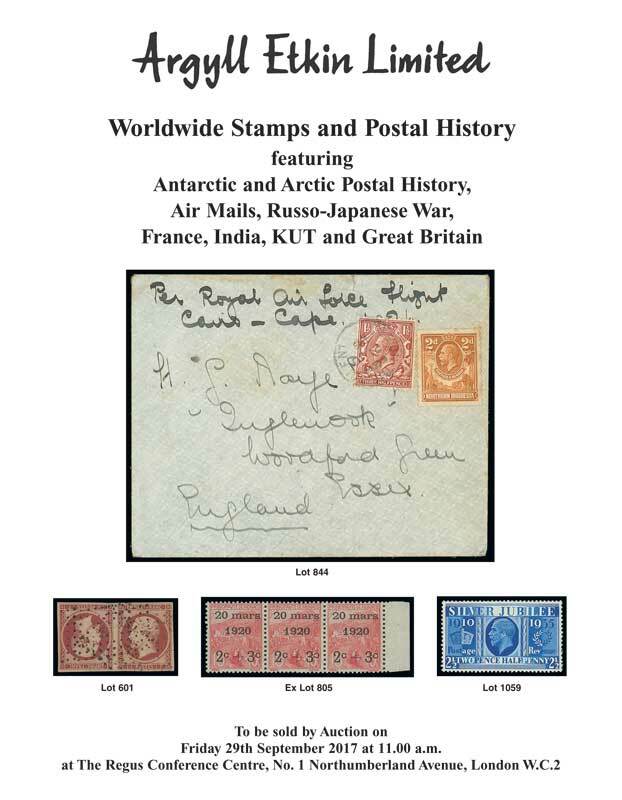 Also from 1934 a Bouvet Island Expedition cover sold for £760. A remarkable assembly of Falkland Island Dependencies 1955-57 Aerial Survey material sold for £1,650. Turning to North Polar material, a 1901 Peary Relief Expedition cover from Greenland made £760 and a 1925 flown cover from the MacMillan Aerial Survey of Greenland reached £880. The 1926 Byrd North Pole flight expedition saw a pair of covers reach £1000 while the Italian 1928 Umberto Nobile Airship expedition and rescue missions to Spitzbergen saw exceptional interest with a cover from Italy to King’s Bay selling for £5150; the 1926 Amundsen Ellsworth Nobile Leningrad to Alaska flight saw a cover from Spitzbergen to Alaska reach £1400. An unusual collection of proof cancellations prepared for the Colonial Office in 1948 saw those from Malaya and Singapore reach £2350 and the Trinidad group reach £450. Turning to British Occupation of Italian colonies in World War 2, a pictorial set of Italian East Africa overprinted “British Occupation” yet not issued sold for £1,650 A Marc Pourpe 1914 flight cover from Halfa, Sudan to Cairo, sent to Lady Stamfordham in London made £3,650. A France 1862 Napoleon III 1f carmine tete-beche pair sold for £4,100, a major rarity of French philately. A delightful China 1885 Large Dragon cover to Bordeaux, France reached £16,500. In Asia, remarkable early photographs from Hong Kong c.1880 reached £2,350, and a rare Labuan 1865 front to Manila bearing a combination of India and Hong Kong stamps made £9,000. A new discovery for India used in Muscat, the 1854-55 imperf, anna blue die 1 with fine 309 cancel reached £2,470. An 1859-1946 India collection including 1909 King Edward VII Officials reached £6450, while a superb 1948 Gandhi FDC made £700. In the West Indies, an Antiguan 1845 1d concession rate letter, the first recorded from this colony, sold for £1500; this was also unusual as the 1d due was represented by a coin sewn onto the letter. Jamaica saw a fine lot of railway covers with a 1916 Ipswich cancel selling for £820. Great Britain saw a 1d Red plate number cover collection sell for £4,250 and a 1780 letter concerning the Gordon riots sell for £360. A remarkable holding of 1911 London Windsor airmail material saw a rare card flown in both directions sell for £2400, interest has been fuelled by Jeffrey Booth’s new book on this subject. A cover from the 1919 Aerial Post during the rail strike flown from Glasgow to London at 2/3 rate sold for £400. A beautiful sheet of the King George VI 10/- dark blue sold for £3,050 while a 1935 King George V Silver Jubilee Prussian blue made £7,250. A remarkable example of the rare 1751 Perth, Scotland, Lamb cancel made £2000 while a most comprehensive collection of Heathfield, Sussex sold for £1,650. A great holding of Northern Rhodesia material saw a 1963 Postage Due 1/- block of four imperforate vertically and horizontally between sell for £820. Two Rhodesia 1905 postcards to Belgium, almost certainly from Belgian Congo, tied by Kalunguisi postmarks and taking 23 days to get to Fort Jamieson made £3600 while a 1910 parcel label from Mpika containing otter skins sold for £1300. A 1926 Cape to Cairo R.A.F. flight cover, flown from Ndola to Lee on Solent in England, ex the “Osprey” collection, sold for £6450. Southern Africa included an amazing Transvaal block of thirty 1895 Introduction of Penny postage missing three columns of vertical perforations which made £760 and a very rare Cape Town 1919 Peace Celebrations pigeongram which made £1525. The day rounded off with a remarkable Hawaii 1894 paquebot cancel, ex Hosking collection, which sold for £700. A strong room left with their purchases of amazing material and bidders await the next Argyll Etkin sale scheduled for Spring 2018. Consignments of suitable material are invited. © 2019 Argyll Etkin. All Rights Reserved. Website By: Blue Smarty.